For its passenger service, the Denver & Rio Grande Western Railroad purchased 4- 8-4s in two orders, from the Baldwin Locomotive Works. 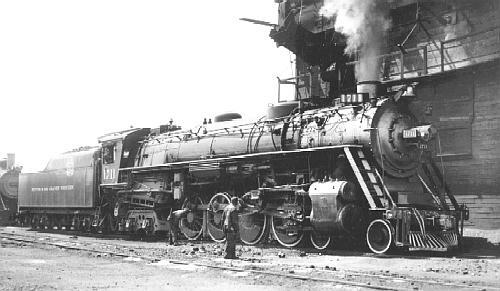 In 1929, 14 Class M-64 locomotives and in 1938, another five, this time Class M-68. The D&RGW liked the name "Western" instead of "Northern" for these locomotives. The Rio Grande ran fascinating combinations of heavyweight and streamlined cars in their trains from 1948 to 1968. Most heavyweight cars were painted from the old Pullman Green into the "Grande Gold" color scheme in the early 50s. This colorful period began with "Westerns" hauling the heavyweight EXPOSITION FLYER with brand-new Budd CALIFORNIA ZEPHYR cars (especially Vista- Dome coaches) mixed in. This is one of the few instances where one could ride a regularly-scheduled dome car behind a steam loco. By 1956, all of the D&RGW "Westerns" had been sent to the scrapper. The "Westerns" gave way to FTs, Alco PAs, F3s and eventually the F7s. Once the CZ consists were complete, Rio's heavyweights were eventually repainted and used in the ROYAL GORGE, YAMPA VALLEY MAIL and PROSPECTOR. For the ZEPHYR, the PAs were painted solid silver with orange noses. The FTs, F3s and PAs were originally delivered and run in a black body/gold stripe scheme till the early 50s then all were repainted "Grande Gold". The PROSPECTOR and ROYAL GORGE were well-known for their combo consists till their demise in the mid-60s. The Rio Grande also purchased streamlined coaches, diners, dome-observation cars and RPOs from the Chesapeake and Ohio in the early 50s. Data from tables in 1930 Locomotive Cyclopedia. DeGolyer, Vol 81, pp. 465-503+. Works numbers were 60712-60721 in February 1929 and 60920-60923 in July. Firebox fitted with combustion chamber that supplied 78 sq ft (7.25 sq m) and 103 sq ft (9.6 sq m) of thermic syphons contributing to the firebox heating surface, boiler had Elesco K-50-C feedwater heater, piston valves measure 14" in diameter. Known on the D & RGW as Westerns. See the Utah Rails website --  -- for a discussion of the D & RGW's green boilers. The M-64s weighed considerably less than the later express M-68s (Locobase 258), which made them more suitable for the Moffat Tunnel route. Data from D&RGW 1-1954 locomotive diagram book supplied in May 2005 by Allen Stanley from his extensive Rail Data Exchange. See also "4-8-4 Cousins", Trains (December 1943, p. 29. (Thanks to Chris Hohl for his 22 February 2013 inquiry about the valve gear that led to the entry's update and for his 9 February 2018 emails supplying the Trains item..) Works numbers were 62130-62134 in 1937. More frankly passenger haulers than their fourteen predecessor M-64s, these five Westerns (not Northerns, by the Rio Grande's reckoning) were superpower locomotives in all respects. The had roller bearings on axles carrying larger Baldwin disc drivers. Laid out as a , the firebox heating surface included 139 sq ft (12.91 sq m) of combustion chamber and 122 sq ft (11.3 sq m) of thermic syphons (located in both the firebox and the combustion chamber). 14" (356 mm) piston valves supplied steam to the cylinders. Their design later formed the basis of the Missouri Pacific N-73s procured in 1943 (Locobase 266). They ran from Denver to Salt Lake City -- 745 miles (1,199 km) through the Royal Gorge and Tennessee Passes hitting 80 mph (129 kmh) in some spots -- until retirement in 1952-1954.